Who were these girls and how did they start singing like this? OK, let’s start with the startling truth. Most people have never heard of the Boswell Sisters, even though they were arguably the most talented, most innovative and best of the swing and jazz vocal ensembles. 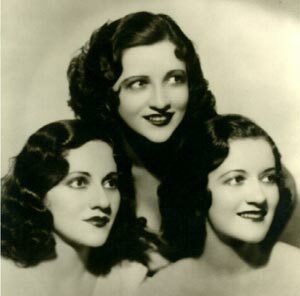 Even fewer people have actually HEARD the Boswell Sisters (meaning their music). Good question and one that you may find some theories on Bozzies.com message board. But 70 years after their last recording together, you can still hear the excitement, the hot harmony and the flawless timing that made the Boswell Sisters burst on the scene in 1931 and change the world of music forever. And that’s where the Boz begins. The only way to Get Bozzed is to listen to the music of CBoz (Connie) MBoz (Martha) and VBoz (Vet) and let yourself go! And the more you learn about the Sisters, the more Bozzed you’ll become. How will you know if you are Bozzed? The clowns at Bozzies.com put together a “diagnosis” for your enjoyment. Symptoms: The state is characterized by reaching an “Avalon of the mind”, where the world is rolling along, singing a song and the sun shines night and day. The Bozzed usually have an overwhelming sense of well being and tend to wear a secret smile. Frequent toe-tapping and rhythmic hip-shaking is observed in many cases. Although usually quite lucid, alert and cognizant, the Bozzed may lapse into a trance-like state upon exposure to certain songs. Getting Bozzed has been shown to treat depression as successfully as drugs without the sexual side effects. (Warning, exposure to certain Connie Boswell numbers has been shown to significantly raise libido). Treatment: Getting Bozzed is incurable. The only treatment is to keep listening and keep swinging! Contraindications: Not all who are treated to the Boswell music will be able to attain a state of Boz. A predisposition to good taste and a swinging soul are required for best results. Bad reactions have been observed in the un-hep. Wrinkles may occur from persistent grinning. Care should be taken not to Boz while performing surgery or other activities where keeping time could lead to injury or death. Getting Bozzed may be habit forming. But who cares! You know that caggle-dows give miggle dilk. You carry CDs with you so you can Boz your buddies. You sing to chickens, just because. You use “come and share thy boon with me” as a pick up line. Tell us how you know you’ve been Bozzed and we’ll add them to our list!